Background: Biodegradable nanoparticles with diameters between 100 nm and 500 nm are of great interest in the contexts of targeted delivery. Objective: The present work provides a review concerning the effect of binary organic solvents together with emulsifier on particle size as well as the influence of particle size on the in vitro drug release and uptake behavior. Methods: The polymeric lipid nanoparticles (PLNs) with different particle sizes were prepared by using binary solvent dispersion method. Various formulation parameters such as binary organic solvent composition and emulsifier types were evaluated on the basis of their effects on particle size and size distribution. 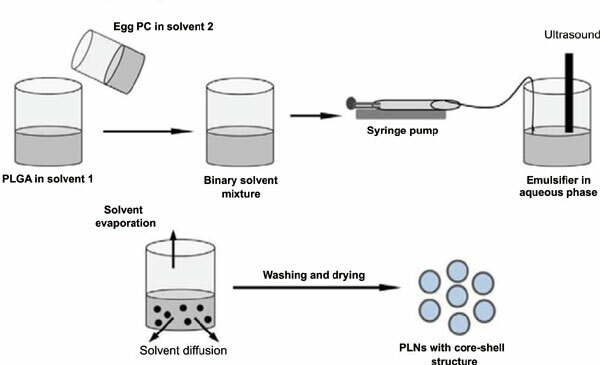 PLNs had a strong dependency on the surface tension, intrinsic viscosity and volatilization rate of binary organic solvents and the hydrophilicity/hydrophobicity of emulsifiers. Acetone-methanol system together with pluronic F68 as emulsifier was proved to obtain the smallest particle size. Then the PLNs with different particle sizes were used to investigate how particle size at nanoscale affects interacted with tumor cells. Results: As particle size got smaller, cellular uptake increased in tumor cells and PLNs with particle size of ~120 nm had the highest cellular uptake and fastest release rate. The paclitaxel (PTX)-loaded PLNs showed a size-dependent inhibition of tumor cell growth, which was commonly influenced by cellular uptake and PTX release. Conclusion: The PLNs would provide a useful means to further elucidate roles of particle size on delivery system of hydrophobic drugs. Binary organic solvents, emulsifier, polymeric lipid nanoparticles, particle size, cellular uptake efficiency, hydrophilicity/ hydrophobicity.